Total Foot Care is the podiatry practice where advice/treatment is offered for a complete range of foot problems. Issues with the feet occur in all age groups and range from the minor, irritating problem to the completely disabling. 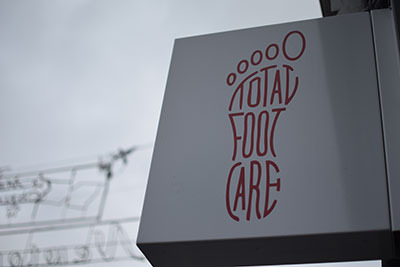 Led by a vastly experienced foot care specialist, Total Foot Care offers a comprehensive service which can address all forms of foot disorders. A consultation and routine treatment is offered at a modest price. More complex problems may require advanced forms of treatment which will naturally cost more than routine care. However, even these advanced treatments are offered at an affordable price. All disorders of the feet are dealt with; treatments can range from routine care - nail care, callouses and corns, dry skin etc - to minor surgery such as correcting painful ingrowing toenails and obstinate verrucae and to consideration of surgical correction of foot deformities. A full range of foot accessories are available such as moisturisers, anti-fungal preparations, protective devices for pressure areas of the foot and orthoses (devices which are worn in the shoes to correct disorders of balance or gait). Whatever the foot complaint, small or large, Total Foot Care can provide the required assistance.